The art of embroidery is the commonly known technique of using a needle with thread or yarn and stitching patterns onto fabric. Although this form is not new, we are beginning to see trends and advancements to make embroidery easier. Most people who embroider don’t mind the time it takes to complete a project or to fix rips and tears. 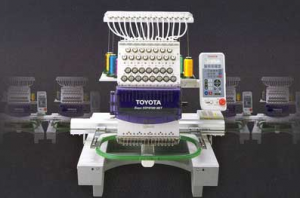 But for those who work in commercial embroidery, they’ll appreciate any upgrades that make the process of embroidery quicker. There has been a lot of buzz about the future of embroidery. One trend that’s noteworthy includes the use of computerized sewing machines and digitized equipment. Computerized or digitized sewing machines may stitch just like a regular machine, but at a faster pace and provide hands-free benefits. With a computerized sewing machine, you can program up to 100 stitch styles and dozens of patterns. This is because the machine has a microprocessor that serves as the internal memory. There is also a laser that does all of the sewing for you as well as an automatic needle threader. You can program the entire machine by clicking on the high-tech LCD screen. Even though you now have the advantage of sitting back and relaxing with a computerized sewing machine, you still get a beautiful embroidered project. As the world of embroidery evolves, the love of the craft will always remain the same. This entry was posted in Embroidery and tagged Crafts, embroider, Embroidery, Sewing Machine, Stiching. Bookmark the permalink. Follow any comments here with the RSS feed for this post. Post a comment or leave a trackback: Trackback URL.